Farinata, a thick, savory crepe, is street food in Italy. Easy to make and a tasty snack. They are made out of chickpea flour which has a sort of egg-y quality to it when it forms a batter. * If you have a larger cast iron skillet, increase the amount of batter. Pour the water into a bowl. 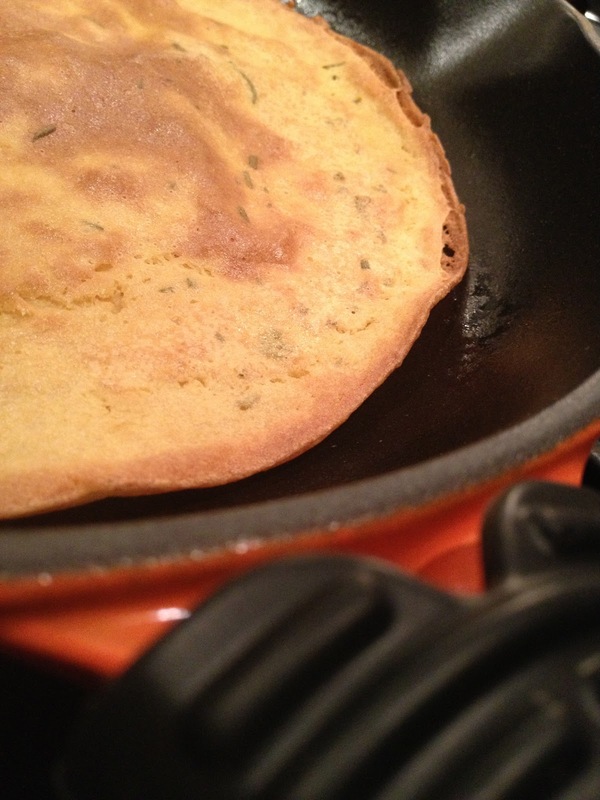 Whisk in the chickpea flour until it is a smooth batter. Let stand at room temperature for an hour. Whisk in salt, rosemary and 3 tablespoons of oil. Heat cast iron skillet on the pizza stone in the oven for 10 minutes. Carefully take the skillet out of the oven. Add 1 tablespoon of olive oil to the skillet and swirl it around to coat. Using a medium size soup ladle, ladle the batter into the pan. Bake for 20 to 25 minutes until brown and crispy around the edges. Slide the farinata on to a cutting board and using a pizza cutter, slice into into wedges. Enjoy! This stuff is great. I love using it as a quick base for a pizza, then throwing toppings on it.